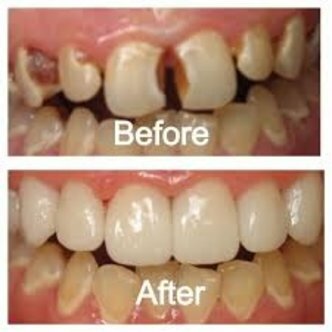 Over time, our teeth begin to weaken and become more susceptible to problems like decay, cracks and discoloration. If you feel your smile isn't what it once was, crowns can help you bring it back to its former glory. During your initial appointment with Dr. Rowe, he will look at your problem teeth and explain exactly how crowns can help prevent any more problems. A crown is the best way to protect a weakened or cracked tooth. The process of installing a crown typically takes 2 visits to the office. On the first visit, the tooth will be reshaped by filing down the enamel so that the crown can be placed over it. For your comfort, you will be given a local anesthetic prior to this part of the procedure. Once the tooth has been reshaped, Dr. Rowe will take a mold of that tooth and the surrounding teeth. During this first appointment, you will also be fitted with a temporary crown. This will ensure that your tooth stays protected before you receive your permanent crown. This mold will be sent to a dental lab, which is where your new crown will be created. Your crown will be specially designed to look natural and fit perfectly on your tooth. Crowns can be made from gold, porcelain or porcelain fused to metal. If you want to maintain a natural look and feel, a porcelain finished crown is best, as it can be matched to the shade of your other teeth. This will allow it to blend in and appear just like one of your natural teeth. Each type of crown comes with its own benefits, however, which Dr. Rowe will gladly explain for you during your appointment. The crown takes about 2-3 weeks to be completed. Once it has been finished and perfected, we will schedule another appointment with you to place and fit your new, permanent crown. Dr. Rowe will once again ensure your comfort by numbing the area with a local anesthetic before cementing the tooth in place. And that’s it! You can then say hello to your new smile. Crowns are durable and will last a long time if they are properly cared for. You should care for them as you would any of your other teeth with regular brushing and flossing. You should also come in for regular cleanings and exams to maintain your best dental health. Call us today if you would like to learn more about how crowns can help restore your smile. At the office of Dr. Samuel V. Rowe, you can rest assured you will always get unwavering care and unparalleled excellence with each and every visit. We are located in Ft. Pierce and also serve the Port St. Lucie, Vero Beach, Stuart and Okeechobee areas with comprehensive cosmetic and medical dentistry. Contact us today to learn more about crowns and the many other services we offer.